Preheat your oven to 400F | 200C. Place sliced tomatoes on one half of a rimmed baking sheet. Drizzle with olive oil, salt and black pepper. Place in the oven for 15 minutes, then add the asparagus. Continue cooking the veggies for 10 more minutes. In a small pot, pour boiling water over dry couscous, cover and put aside for 10 minutes. Remove tomatoes and asparagus from the oven and let cook slightly. Slice asparagus into 2” pieces. In a small bowl combine lemon juice, Acropolis Organics EVOO with fresh lemon and a pinch of salt and pepper. 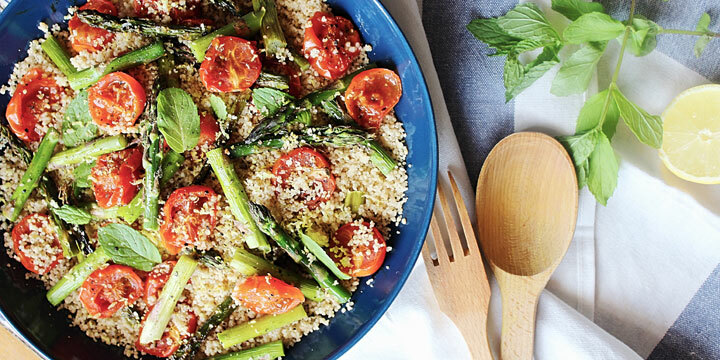 In a salad bowl combine couscous, asparagus, cherry tomatoes, fresh mint, lemon zest and pour in the dressing. Stir to combine well and enjoy!